Regardless of your tastes and habits, there is a coffee maker out there for you. Follow this guide to learn more about your options and which type of coffee maker best suits you. In case you missed our Coffee Beans Guide, Please read it here. Just like Coffee Beans, Coffee Makers are also quite old and date back to 17th Century. In France, the first infusion brewing process was introduced in 1710 which worked on a simple process of adding ground coffee in a linen bag and submerging in hot water until the desired strength brew was achieved. Since that time, a lot of innovations have been made to Coffee Makers, each made for different brewing techniques. Drip brewing, a technique which involves making coffee also dates back more than 125 years. Several other coffee makers like Percolators and Vacuum brewers also date back around 100 years, the modern coffee makers have become more advanced with automation which lets you customize your brew. Please read our Top 10 Best Coffee Maker Reviews 2018. There are some different varieties of coffee makers on the market that can offer you a range of features and functions you may have otherwise thought impossible. Below you’ll find a different type of coffee makers which are available in the market right now with their advantages and disadvantages with the price range. Percolators are one of the oldest methods of coffee making and are still used today. They can be stovetop or electric powered and are great for use outdoors or for adding a vintage touch to any kitchen. Since percolators brew at a higher temperature than automatic machines, the coffee is always piping hot. Coffee brewed this way will be stronger in flavor and offers more control over the brewing process. Percolators are durable, convenient and make for easy travel use. Because of the nature of percolators, it is easy to over-extract (or over-brew). This can cause coffee to taste too bitter. Perfecting the brewing process can take a few tries and extra time. They do not offer automatic options like automatic turn off, timers or brew strength presets. It can be easy to make a mess with this method. And the percolators can be tedious to clean. There are various parts to unscrew or remove and they may not be machine washable. French press coffee makers are manually operated and require a more coarsely ground coffee bean. The grinds are steeped in hot water and then plunged by a separate device (with a filter attached) to separate grounds from the coffee extract. The coffee is made and poured from the same carafe/mechanism. French press systems brew flavorful and strong coffee. They are extremely easy to use and easy to clean (some parts may even be machine washable). They do not use electricity and do not take up much space. They are a greener option for any Eco-conscious citizen. Manual French press makers do not have automatic settings, making it more complicated to control brew strength and timing. If coffee grounds are made too fine, they can slip through the filter when plunged. This can result in ground residue and can be frustrating. They do not have warmers or hot plates to keep the coffee warm after it is brewed. Once it is made, it’s best to consume it immediately. These machines are similar to the manual French press systems in that the course grounds are filters through a plunging mechanism. However, with electric presses you will not need to boil water in a separate device, making them more convenient. These machines can be used to boil water for other things like tea and instant meals. They are a smart and versatile purchase. They brew flavorful coffee that is rich in aroma and taste. Some even offer a grinder attachment/feature for properly ground coffee beans. Electric French press coffee makers are quick and easy, and some even offer temperature controlled brew settings. Most electric French press systems will need to be cleaned after each use. This can be a hassle and may be difficult for anyone with a busy schedule. Like French manual presses; these do not usually make more than a few cups of coffee. Not necessarily the best choice for a full house or group of people. Most of them come with warming features to keep coffee hot after brewing, but they are not very efficient, and after time the coffee cools down. These are probably the most common coffee makers and offer various settings. With automatic drip machines water is heated in a tank (usually attached to the side or back of a machine) and then pushed through the coffee grounds (via a filter) directly into a carafe. They are extremely convenient and offer various features like an automatic turn-off, brew strength control options and timers to start and stop brewing to your liking. These machines can typically brew up to 12 cups of coffee and are great for families or people who consume more than one cup of coffee per day. Automatic drip machines vary greatly in price but are usually built to last, fairly easy to clean and affordable. Chances are good, even if brewed strongly; the coffee will not have the same quality of flavor or aroma as with a French press maker or percolator. It is easier to waste coffee (and money) with these machines. Leftover coffee will most likely be thrown out. They use electricity and are easy to forget about as you go through your busy day. If you purchase an automatic brewing machine that does not offer an auto turn-off feature, you will need to remember to unplug. Prices: ranges from $10-$600 (multiple drip/carafe machines will cost into the hundreds but are usually only seen in small bed and breakfasts or similar businesses). Capsule or pod coffee makers are the newest addition to the market and offer extreme convenience. With these high-tech machines, coffee is sold in sealed, pre-packaged containers of grounds. These are placed into the machine and pierced or pressed to allow the hot water through for brewing. Super easy to use. You can choose from various brew settings (small cup or large cup) and will not have to measure any coffee grounds or use filters (each pod usually produces one cup of coffee). You will always get the same quality. With these machines, you can consistently brew the same cup of coffee. Never be disappointed or unsatisfied. These machines also save electricity because they do not consistently work to keep the coffee warm after brewing. They are also much more efficient with their use of water. These machines aren’t saving any trees. And they can be an expensive choice.You may save money on wasted coffee, but the pod cost will add up fast. And the machines are not the most inexpensive, to begin with. You do not have as much control over brew strength or flavor since you will be purchasing pre-packaged pods. You have to trust the machine and pod. They can be larger than other options and may take up a lot of counter space. Espresso machines come in wide variety of options (dual boiler, heat exchange or automatic machine) and are probably the most complex to use. However, you don’t have to make daily coffee shop runs to enjoy espresso-based drinks. There are plenty of models that are made for home use as well. The smooth and strong flavors of espresso are worth it for passionate coffee drinkers. In a dual boiler machine, there are two separate water heaters (or boilers). One is used for brewing and one for steaming. This allows for a perfectly blended (and heated) drink without the extra work. Similar to dual boilers, heat exchange espresso machines also offer the convenience of not having to froth or steam milk separately. Heat exchange espresso machines may not give you a consistent brewing temperature. They can fluctuate more than a boiler system espresso machine. Espresso machines are the expensive choice and can cost up to thousands of dollars. Dual boiler machines take up a great amount of space and may not fit in smaller kitchens or rooms. It is worth noting the other tools and items you may need to brew the perfect cup of Joe. The following are additional accessories you don’t want to forget. You do not necessarily need to have your grinder. Plenty of local stores and shops sell pre-ground coffee. However, for some methods (like French press or espresso machines) the proper grind of the bean is imperative to the quality of your coffee. It may be worth doing it on your own for the freshest and best tasting coffee. Grinders come in various shapes and sizes and can run from anywhere from $15-$300. Filters come in two different styles. They are either a basket or cone shape and can be made of either paper or reusable (washable) materials. Basket filters normally come in a 4 cup or 8-12 cup size and cone filters usually come in #2 (4 cup maker) or #4 (for 8,10 or more cup maker) size. Every coffee maker is different and will require a specific size filter. You can brew the best cup of coffee in the world, but you need something to put it in. They’re plenty of mugs to choose from, and they vary in shape, size, and color. Many even come with easy grip and travel features (like thermal exteriors for temperature control). Travel mugs are common for people to use on the go or when commuting. And every coffee drinker knows the perfect mug only makes the drinking experience that much better (prices vary $10-$50). What type of machine should I have? This depends on what type of coffee you like to drink and your tastes. Review the above specifics to decide which machine might be best for you. If you are on a budget, automatic and French press machines offer loads of affordable and quality options. If you are a coffee connoisseur, you may want to opt for an espresso machine or one with more customization features. How do I clean a coffee maker? This will depend on what type of maker you own. The first step is to turn off and unplug the machine (you don’t want to burn yourself or other cleaning tools). You should remove all filters, carafes and other parts so you can clean them according to their specific materials and directions. Some machines may offer machine washable parts and others may not (check your product information). You never want to use steel wool or harsh surface to scrub your machine, and you should always avoid submerging the entire machine in water. I can’t get my coffee to taste right, what do I do? There are various reasons your coffee may taste off or not to your liking. First, check the age and freshness of your coffee beans. This is the first thing that may affect the flavor of your brew. You should also consider the type of water you are using. Fresh, filtered and clean water is imperative for proper flavor. And most machines brew best with water that is first placed into the machine cold. You should also understand that a dirty coffee maker makes for dirty tasting coffee. Keep your machine clean and experiment with brew strengths to achieve the best flavor. Should I have a glass or a thermal carafe? Glass carafes are heated underneath by a hot plate. Thermal carafes use their insulated walls to maintain heat. Neither option is necessarily better than the other. Like any machine offered, there are pros and cons to each. Glass carafes may leave your coffee tasting a bit burnt or over-brewed if left on the hot plate too long. And thermal carafes can run more expensive and do not give you the ability to see how much coffee is left. It’s up to you and what you want. Both work and both can be useful. How do I avoid these annoying drips when pouring my coffee from the carafe? It’s a struggle even the cleanest coffee drink comes across. As long as you slow down and pour your coffee with ease, you should not see any spills. Take a deep breathe, slow down and pour calmly. This should help avoid any annoying drips (as best as possible). You may also want to choose a pod or capsule machine. The coffee can be brewed directly into your mug to avoid the issue in the first place. It doesn’t matter if you drink strong coffee or whether you prefer it light and sweet. It also doesn’t matter if you are a busy mom of 4 or a single senior citizen with daily time spare. There is the perfect coffee maker out there for everyone. The options can be expensive, but a great cup of coffee does not need to cost an arm and a leg. Start with assessing your tastes and lifestyle. 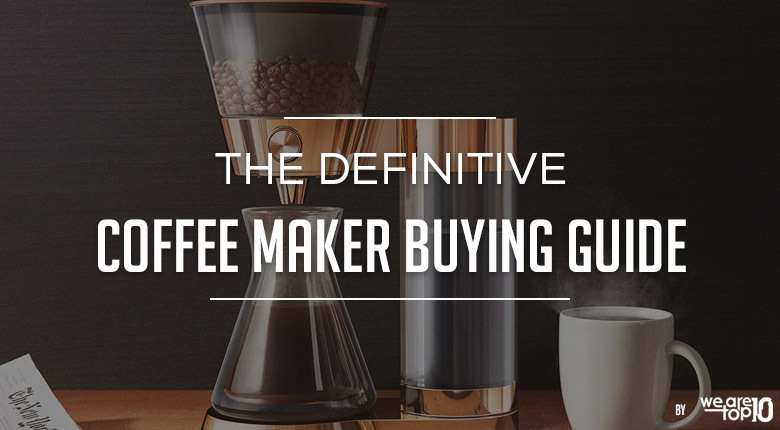 Then you can start to use this guide and explore the wide world of coffee makers. Find the one that best suits your needs and brings one home today!